Two new Brut IPS from 2nd Shift and 4204 Main Street. New beer styles don’t come along every day, so when I first saw a beer called a Brut IPA, I needed to know more. I reached out to Rob Abel, head brewer at Ferguson Brewing and asked him to explain what a Brut IPA is? “The Brut IPA is a new IPA, the rationale for that name is that much like brut champagne is extremely dry, the IPA is extremely dry, having Zero residual sugar left,” said Abel. The style is so new, there really isn’t a clear definition for the beer, but you can bet in less than a year, the Brewers Association will have one. But it also means that craft and home brewers will be forging ahead, creating at will, allowing this style to become one in its own. Able says that in creating the Bru IPA, some brewers are using a chemical used to help ferment stouts a little bit more so that they aren’t as sweet. By eliminating all of the residual sugars, the dryness opens up the hop flavors and aromas to the maximum potential. The first local brewers I’ve found to try a Brut IPA have been 2nd Shift, 4204 Main Street and Center Ice Brewing. These beers are well carbonated, like a nice champagne and even though they are IPS, there is little bitterness. In a recent interview on newtobrew.com, a blog for home brewers, Bill McFarland, head brewer at Center Ice said that despite low bitterness (IBU) Brut’s come with big flavor and aroma. 4204’s Tickle is fairly big beer at 7.9% ABV, and uses the gewurztraminer grape for fermentable sugars and then is dry hopped heavily. 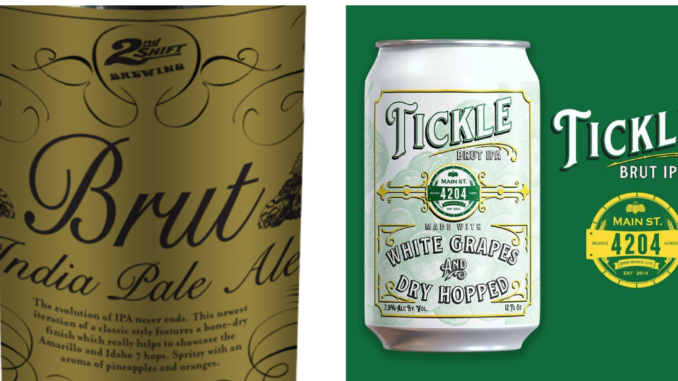 Tickle, true to style is an effervescent beer, hoppy on the nose. It finishes very dry, and tart. A lot has already been written about Brut IPA’s as a fad. Some say Brut’s are a “response” to the widely popular New England IPAs, which some people have grown to love or hate. I don’t offer a lot of opinions here, but I will say, I completely disagree with outwardly loud voices who condemn specific styles of beer, and experimentation of styles. Great, you didn’t like the beer, don’t drink it. It’s like art on a wall, if you don’t like it, don’t look at it. But, beer drinkers should be united in the thought that beer, like art, can only grow if the brewers/artists know they have an audience for whom they can craft and push boundaries. If you take a sip of Brut IPA, and you dig it, fantastic. If you don’t, at least you tried something new and make your own mind up.